Comments: Emory Hill was the youngest son of Major James Christian and Mary Emory (Lamb) Hill, Sr., of Scottsville, VA. Born in Scottsville on September 8, 1883, Emory attended Scottsville School and went on to earn his B.A. degree at Columbia University and his MD degree at the Medical College of Virginia in 1907. 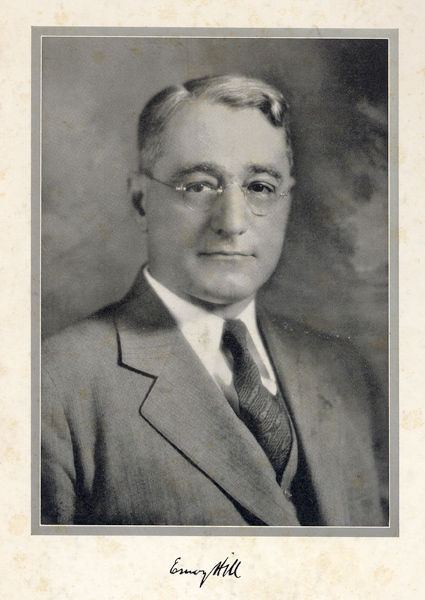 Dr. Hill practiced medicine in Chicago from 1910 to 1919 and also taught at Rush Medical College from 1914-1919. Dr. Hill completed his ophthalmological internship at the Wills Eye Hospital in Philadelphia. In 1919, he opened his medical offices in Richmond and was soon recognized as one of the outstanding ophthalmological specialists in the South. In 1929, Dr. Hill became Professor of Ophthalmology at the Medical College of Virginia, a position he held until shortly before his death on December 4, 1940. He is buried at the Baptist Cemetery in Scottsville, VA.
On April 18, 1911, Dr. Emory Hill married Julia Duval Hawes of Charlotteville, VA. Dr. and Mrs. Hill were the parents of two sons, Walker Hawes Hill and James Christian Hill. Dr. Emory Hill, of Richmond, Virginia, died December 4, 1940, at the age of sixty-one. Dr. Hill was recognized as one of the outstanding eye specialists in this section of the country. "There comes a time in the lives of men when the inevitable call must be answered. The greatest void is left by those valiant few who, like Dr. Emory Hill, have both pioneered and taught." "The honors that came to him were too numerous to be detailed here. Suffice it to say that in 1930, he followed the late Dr. J. A. White, former Professor of Ophthalmology at the Medical College of Virginia, and was secretary for many years of the American Ophthalmological Society. He never gave up his investigative and clinical inclinations, in spite of many outside duties. And he had the relatively rare virtue of being able to stimulate study and research in others. Dr. Hill cooperated with Mr. L.L. Watts in establishing the sight-saving classes in the public schools. He personally examined each applicant. This program has extended throughout the State." "Emory Hill had a brilliant mind, quick in conception and clear in thought, while at the same time he was an arduous student. No one fooled him, and he never fooled himself. He had the ability to express himself succinctly, frankly, and with absolute fearlessness. These faculties made him an exceptional teacher, a wise counselor, an outstanding physician, and a cultured and courageous gentleman. He was not the type of teacher, who is more interested in his own institution than in education." "He gave of his knowledge and of himself unsparingly when there was no hope of reward; and, even when ill, would get out of bed to see cases with minor conditions, because he knew that they did not seem insignificant to the patient." "Emory Hill was a devoted husband and father, a loyal friend, an illustrious ophthalmologist, a learned scholar, a great teacher, and a truthful and courageous man." The photo above was provided by Meta (Hill) Erb of Roanoke, Virginia; Mrs. Erb is the great granddaughter of James C. Hill.